Not terribly photogenic, but quite delicious. I don’t cook Swiss chard a lot, though when I make it, I’m always happy I have and wonder why I don’t make it more often. It’s a fast side for chops or chicken (chop/saute), tops rice beautifully, and fills an omelet like nothing else. Did I mention it’s gorgeous? Last night, after a long day full of lectionary study, lunch out, children’s music meeting, and grocery shopping, I walked in the door not knowing what in the world I was doing with my Swiss Chard for today’s post. I also knew I wanted to be all done with dinner in time to watch the convention; I am, if nothing else, a sincere John Kerry fan. (And he was a superhero last night!! Yikes.) 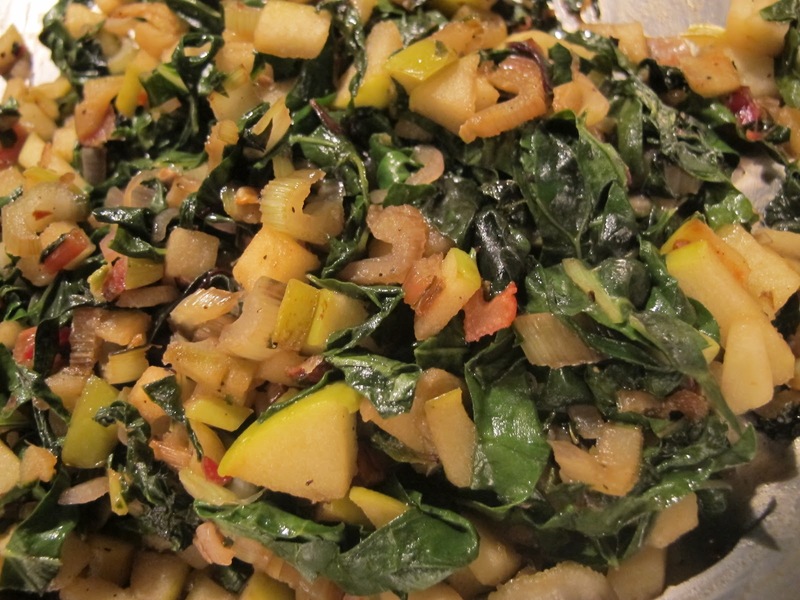 I scouted around the kitchen trying to think what else could go in that pan and what I came up with was luscious–sparky with the apple cider vinegar-red pepper combination and crunchy with the added green apples, shallots, and chard stems. A nice drizzle of local honey evened out the whole thing. We ate it with some cold chicken and a slice of German vollkornbrot (whole grain bread) with a bit of sharp cheese. 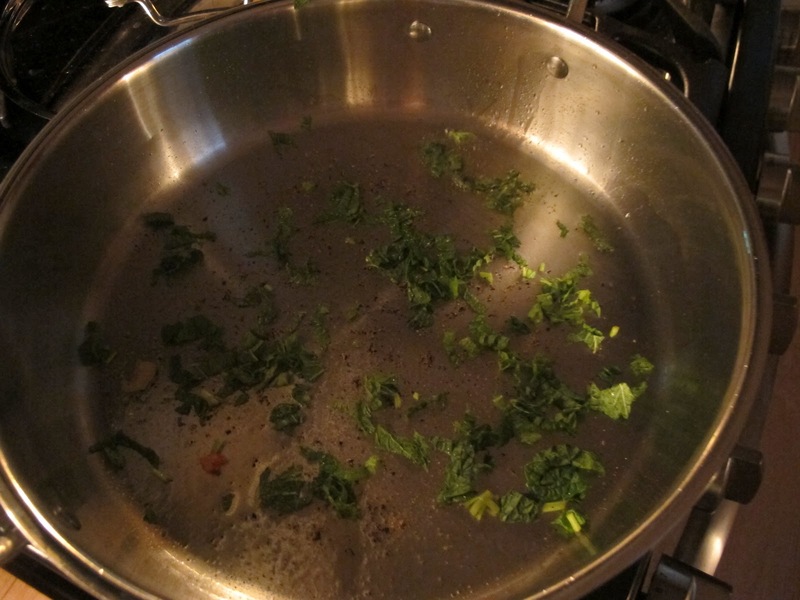 Cook’s Note: Wash chard very thoroughly before preparation. 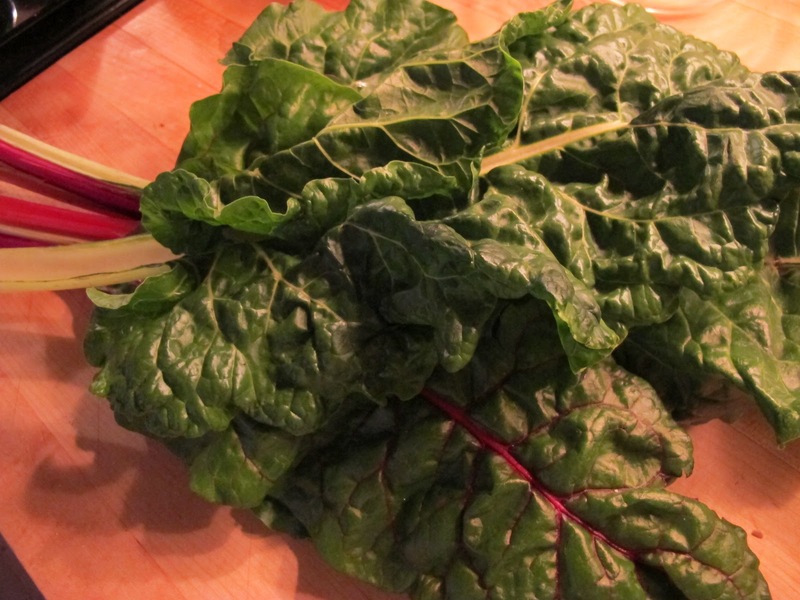 Remove stems from 1 bunch of Swiss chard (1 – 1.5#) and slice thinly. Set aside. Roll up chard leaves and slice into 1/2″ pieces. Heat 1 tablespoon olive oil in a deep saute pan over medium heat. 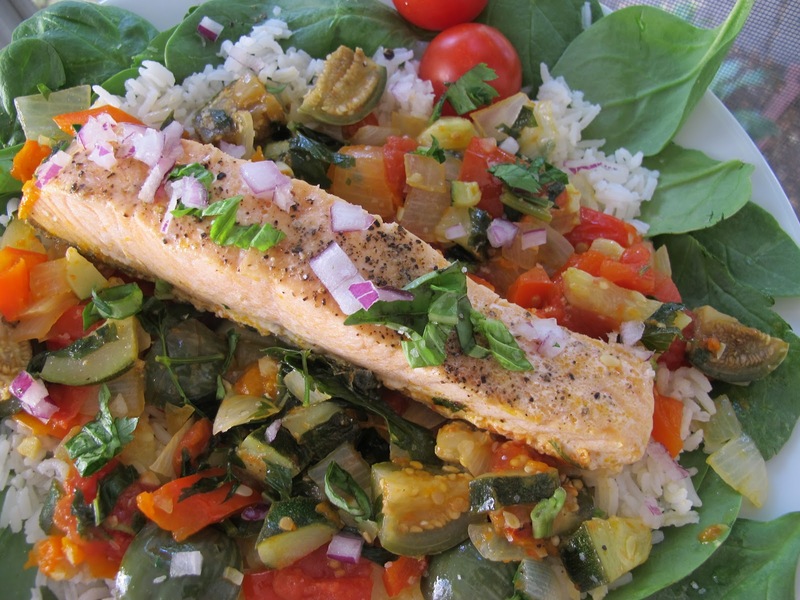 Add pinch crushed red pepper, 2 tablespoons chopped fresh mint, and cook one minute. 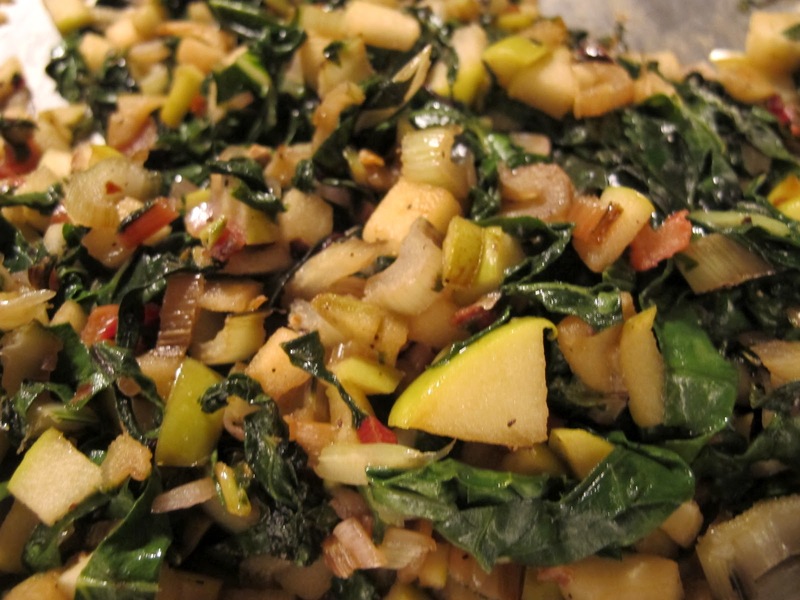 Stir in one minced shallot, reserved chard stems, and 1/2 a chopped Granny Smith apple with skin. Sprinkle with a generous pinch each of kosher salt and fresh ground pepper. 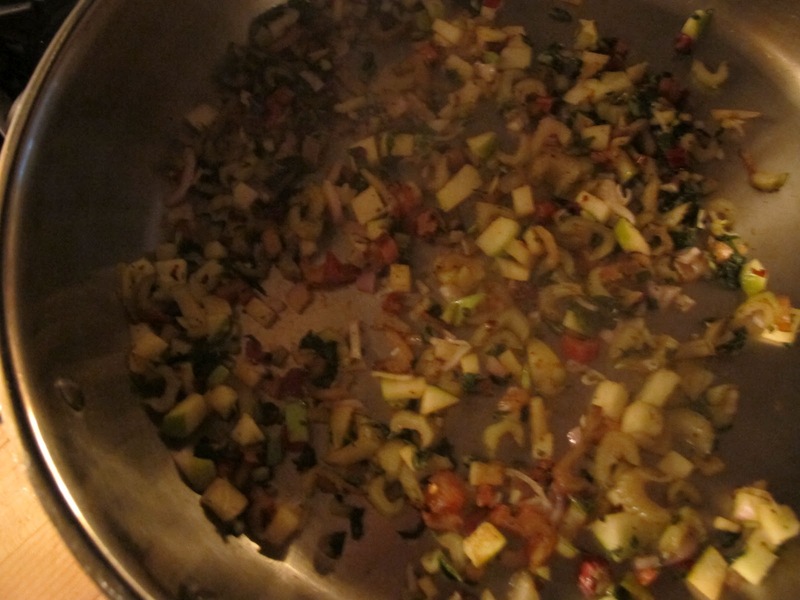 Let cook a minute or two, stirring, until a bit softened. 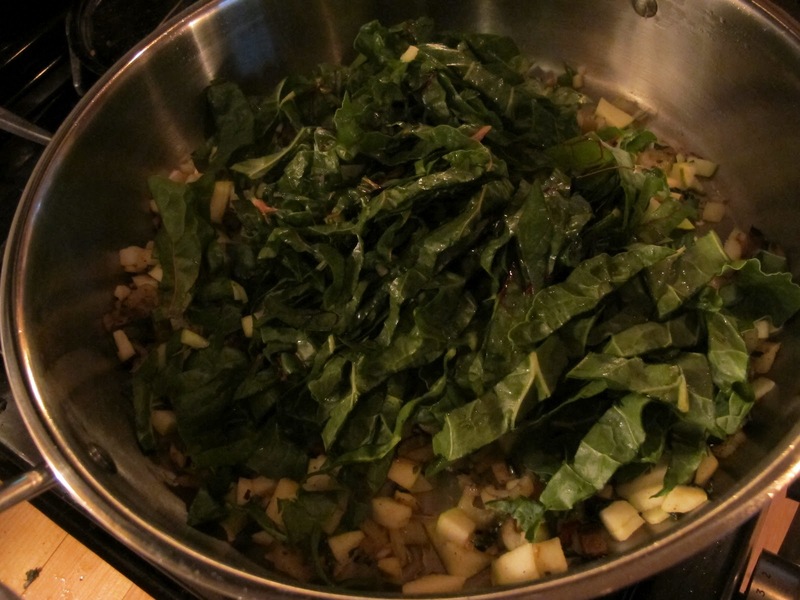 Toss in chopped chard. Season with a little more salt and pepper. Stir. Low in calories and vitamin-dense (C, K, A, B), Swiss chard comes from the same family as beets and is also called silverbeet. Full of antioxidants, it’s a cancer-fighter and usable in all of the ways you use spinach. A great addition to your shopping cart, saute pan, or soup pot, with its store of various minerals (including iron) it’s also a nutritional powerhouse. Young chard makes great salad. Read more here. Could have used young, chopped chard. 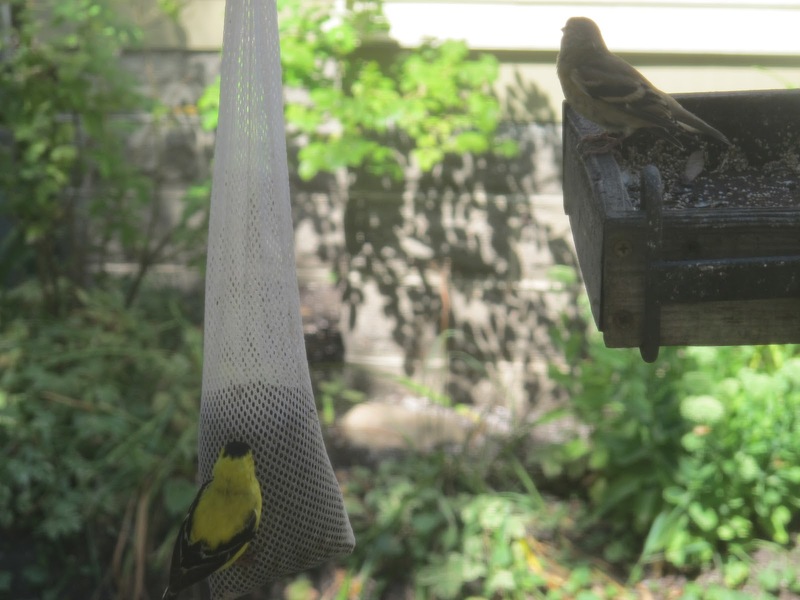 Finches have another brood. 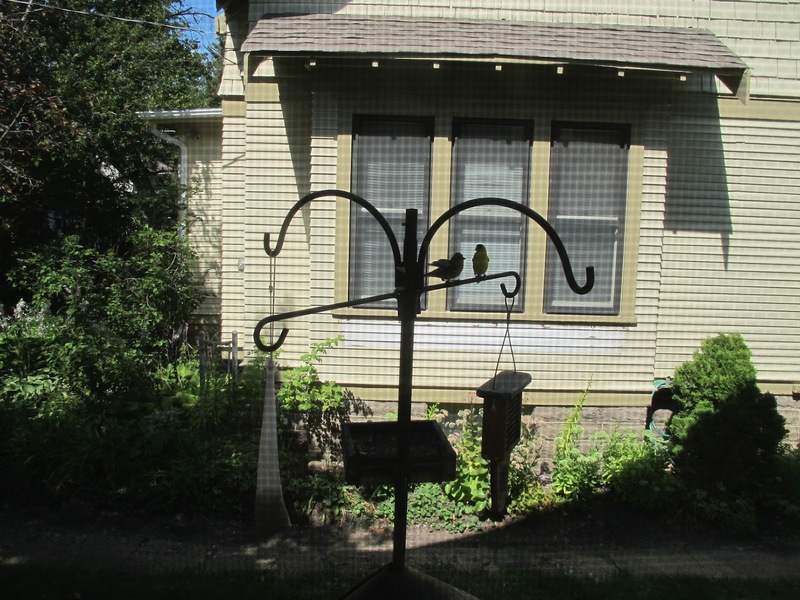 Here parent eats while baby waits above at my kitchen window feeder. 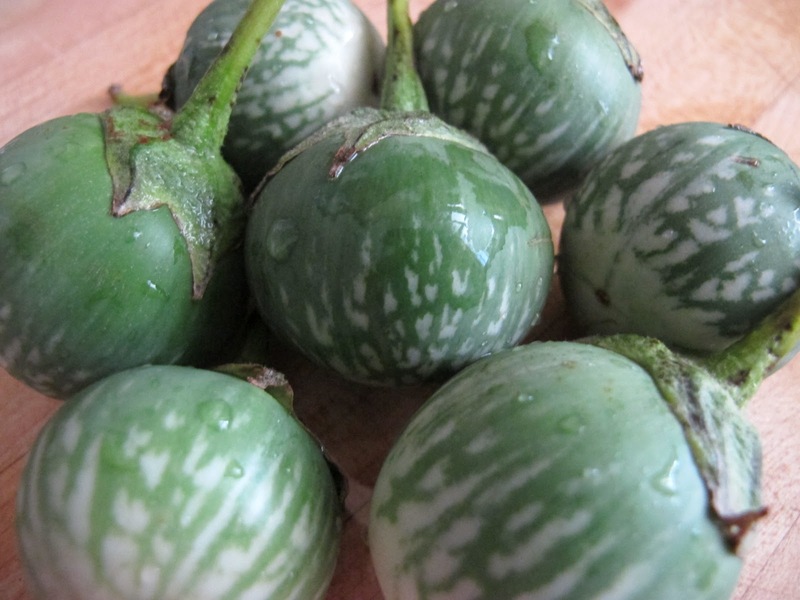 Gorgeous Thai eggplants (1.5″) from the St. Paul farmer’s market–used it in the salmon and ratatouille above. 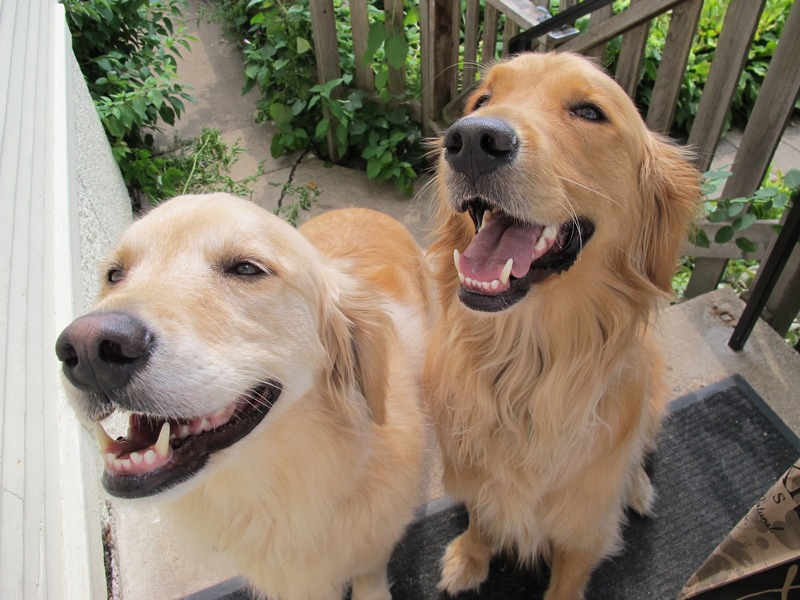 Sure sounds like a great Sunday brunch omelette filling.Your dogs look so sweet. I bet they look up at you with sad eyes when your in the kitchen cooking. @Mireya Thanks; I love chard. 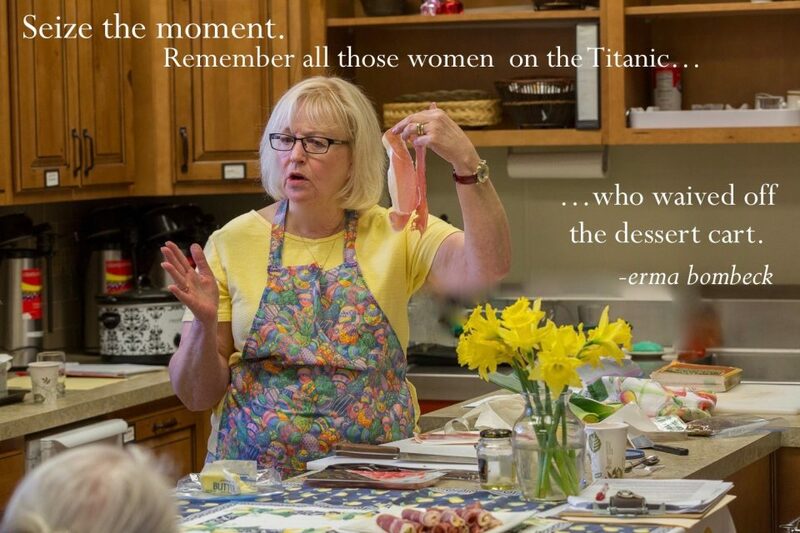 How did your recipe turn out? I'll have to go back and see if it's posted yet. Re dogs: They're under my feet tripping me half the time! Super delicious way to use the greens. And those egg plants ! I can think of so many ways to use them. love them. The sharp cheese must have really paired well with the chard!! @Ansh. I bet you can! Tell me a couple! I never would have thought of Swiss chard and omelets and it does sound like a wondeful idea. @Chaya/Casey: Greens..omelet: yummy! Happy weekend. What a fun read. Loved the photo-recipe guide. 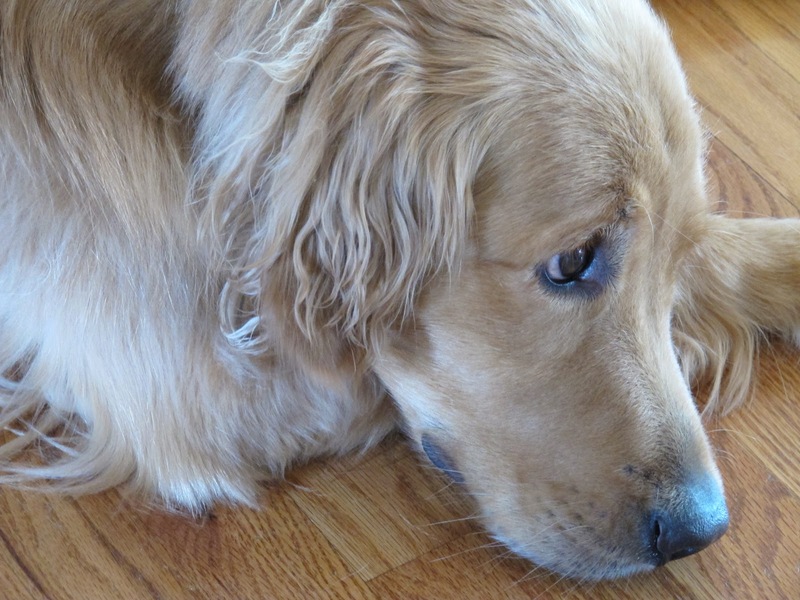 My golden loves to hang out in the kitchen with me too, so much so I've begun to call her my sous chef!